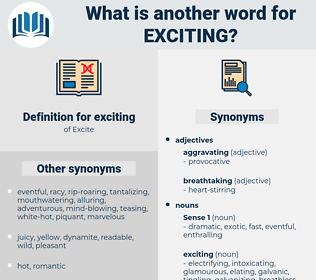 What is another word for exciting? exhilarating, thrilling, breathtaking, excite, fantastic. challenging, appealing, terrific, eye-catching, spectacular, gratifying, vibrant, marvelous, awesome, engaging, stunning, worthwhile, exceptional, incredible, splendid, stimulatory, beautiful, provoking, good-looking, Nurturing, amphetamine-type, astonishing, juicy, enthusiastic, outstanding, advantageous, invigorating, -fascinating, insightful, tempting, marvellous, upbeat, controversial, remarkable, handsome, motivating, striking, up-and-coming, instructive, informative, interested, delightful, astounding, Empowering, surprising, hilarious, extra, excitatory, thoughtful, significant, gorgeous, boisterous, festive, rich. captivating, affecting, Arousing, intriguing, lnteresting, Impacting, catering, Pertaining, commissioning, Involving, challenging, enthralling, focussing, raising, drawing, appealing, gratifying, engaging, provoking. interesting, intriguing, excited, stimulating, inspiring, thought-provoking, compelling, attractive, heartening, wonderful, entertaining, riveting, excellent, passionate, amusing, rewarding, refreshing, encouraging, brilliant, amazing, extraordinary, gripping, inspirational, impressive, charming, magnificent, great, nice, sensational, emotional, lively, glamorous, shocking, seductive, moving, fabulous, formidable, provocative, bustling, disturbing, lovely, unbelievable, tremendous, meaningful, noteworthy, dynamic, funny, valuable, superb, enjoyable, colorful, bright, useful, fun, energetic. unmoving, boring, unenthusiastic, unenthused, unpromising, moderate, unstimulating, uninspiring, dull. A young man, even though he is a clergyman, can't be seen always in company with a pretty woman, without exciting remark. He said I wouldn't believe how exciting it could be at times. exactness, existence, existing, exquisiteness, ecdemic, exacting, equating, executing, extinguish, exceedance, exhausting, exceeding.